One of the things we need to get done for the demo are Move Animations. We can basically say that none are done, since Poccil included like 3 usable ones. Here's a short tutorial on how to get started on them. Don’t worry, you don’t need RPG Maker at all, you can do everything in the starter. Download pokestarter. Extract it, and open it up. Use the arrow keys to move around, enter to confirm and “x” to cancel. Go to Animations and press enter, press “Import All Animations” then “Export All Animations”. Repeat once more (this is just to make sure that you have all your animations, plus the “Animations” folder, after this you just need to “Import All Animations” every time you open up Editor). Now, you need to go back to the Animations folder. 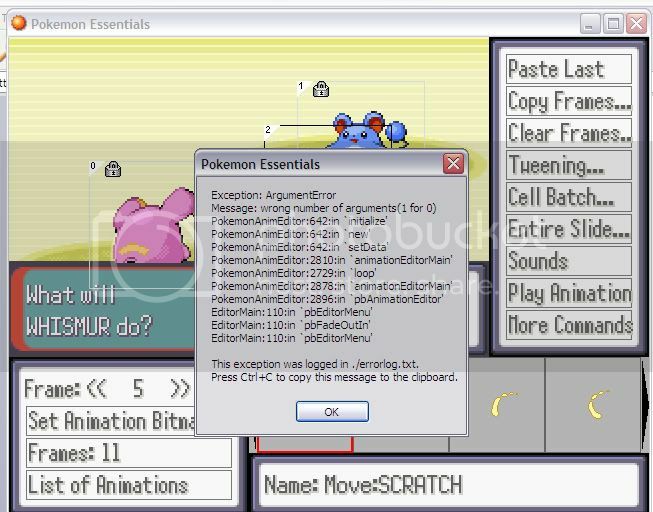 Close Editor, and go back into the pokestarter folder. There should be a folder called “Animations”. Personally, I would use the Fire Red / Leaf Green ones but Diamond/Pearl may fit better with our 80x80 size. Let’s create a move! I did Cherry Bomb. First, you need your sprite sheet. Go into the Animations folder, and create a new folder. Call it Move_MOVENAME, so in our case Move_CHERRYBOMB. Inside, place your sprite sheet. You’ll need to separate each sprite into boxes so they don’t overlap. I used this, and named it Cherry_Bomb.png. For the sake of consistency, name all moves like this (eg. Sand_Attack.png or Marionette.png). Click (with your mouse) “Lists of Animations” and find an empty slot. In my case I used 107. Press F5, and rename the slot to MOVE:MOVENAME. Do not use spaces. Then, select it and you should have the same screen, but with your sprite sheet on the bottom left corner. To animate, just change a frame number, click on a sprite on you sprite wheel, then click where you want it. You can adjust with the arrow keys or even more finely with arrow + alt. If ever you need to see how it looks, just click “Play Animation”. Careful though, if you made your Pokemon move, it will not show up on “Play Animation”. (You can unlock the Pokemon sprites by clicking on their sprite and pressing L). Adjust the number of frames by clicking on the Frames: # button. If you want something to move from point A to point B smoothly, you can use the “Tweening” button. Experiment a bit. Once you are done. Press Esc. Make sure you save changes before you exit! Once you’re back into Editor, “Export All Animations” and then you’re done! ALL animations need to be done. Including the ones from canon moves such as Hydro Pump. You can feel free to change how they look from the games, since the games change anyway. There needs to be two animations for each move, one for attacking and one for defending. Oh wow, and here I thought animations were going to be our toughest challenge programming-wise. This program and your tutorial will make the process much easier. I'll start tinkering with it tomorrow. There is no dibs, best gets through. 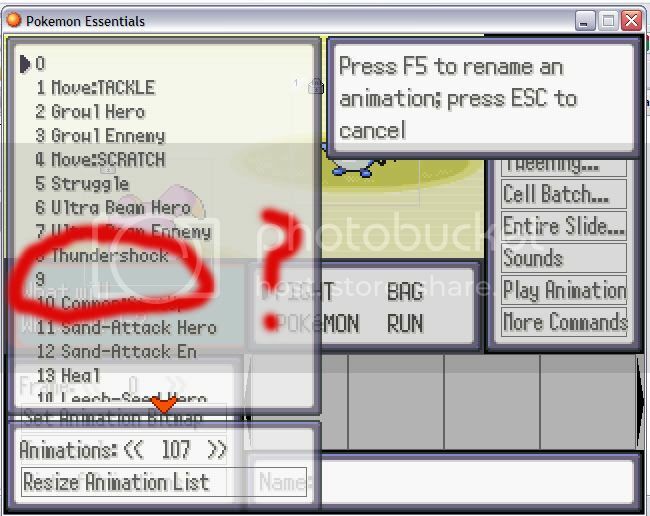 EDIT: What size do the animation boxes things have to be? Last edited by Black Temple Gaurdian; 06-30-10 at 05:09 PM. well then, I'll make mine the best Take out "anyone" in my way!!! DUN DUN DUN! jk. Well, I've already got those half way, so that shouldn't be to hard though. How do you post them? Last edited by Quinn; 06-30-10 at 04:38 PM. Hmm, sounds a little complicated but I bet even I could do a few after a couple of tries. awesome! "THIS IS GONNA ROCK!" You’ll need to separate each sprite into boxes so they don’t overlap. How big do the images and the gaps between them have to be? It might be just me, but I dont think it matters, as long as their separate. I can't remember though, sorry. Try that though. I could see some awesome moves using RBY/GSC Revamp images. I might have to try, but my computer does not take downloads well. Nope, there's a predifined gap between them I think. Or it could be because I'm not using sheets with a transparent colour. Anyway, 192x192 pixels is the maximum. by the way, what about sounds? Umm, how do you get a transparent image that isn't GIF? I'm trying to find psychichs I found surf. Uh, no duh. Now then, mind answering the question How. Do. You. Make. It. Transparent? I think RPG maker can turn it transparent itself, if I remember correctly. If you have photoshop you can just delete it, for both. if you use paint, then I'm not sure. I know there are sites that can do it. Does anyone else have toe sounds? excluding psychic and surf, should I forget about sounds for now? Although I've got that one sound thingy? I was thinking for Overload you could just splice together the Charge animation and the bright blue Thunder thunderbolts. WTF is happening! I worked for 10 hours on this! How many did I get done? NONE! My 1st issue, is once I made the file and imported it, when I would put the name in and open it, my sheet wasn't there. I had to put it from the bitmap thingy. 2nd. I would get an error message about every 30min -1hr. I saved once every 5 minutes, so I thought I was safe, but then...3. Once it closes, I import everything, then go into the editor, and go to the list. It wasn't there once! WHAT THE HELL? I was so amped about making these (IB knows), but I can't do it if I can't figure out what is going wrong. Somebody know whats going on? Last edited by Quinn; 07-01-10 at 05:08 PM. Also, since the thing doesn't allow backgrounds, those are put in when they are in RPG, at least thats what I think. here is what backgrounds I have basically for psychic and surf. Surf: Yet again, just a quick upload. It goes up, like the GS version as well. A more "easier" way to say the problems. once I enter the name, it doens't come up with my sheet. It keeps those empty gray boxes. one of the error messages. Last edited by Quinn; 07-01-10 at 05:51 PM. Couldn't we just ask someone else who's making a fangame for the canon animations? There's got to be someone that has them. It would be faster so Badara can hopefully finish. I could ask around on Pokecommunity (I know a couple people making fangames there) if you want. It's not trying to say that we shouldn't make our own, it would be cool, it's just that maybe we should try and use canon ones in the interest of getting the demo out while we have Badara. Last edited by SilentSentinel; 07-01-10 at 10:40 PM. It's not trying to say that we shouldn't make our own, it would be cool, it's just that maybe we should try and use canon ones in the interest of getting the demo out while he have Badara. Why not ask the guy who's making Pokemon Uranium? Uranium, I believe, was made with RPGMaker, as well...try that, if that helps! Its not really me to call anything, but might I make a gameplan? So, we need many animations for the demo, right? What I suggest everyone do is 1st priority, make the Topaz moves. I dont know which pokemon are appearing in the demo, except mainly Venap, Celsinge, Echoise, Mogel, Fincherp and some others. If we look at there move lists, we can see all the topaz moves we need. See, thats all that would be needed for Venap, if someone can find the Canon moves. he has more, but still. If we can get the canon moves, that will save lots of time for the demo. I still suggest that by the time that the actual finished product comes out, we have completely new stuff, but for the time, use what we got. If we really like a canon move, maybe a quick recolor or background change to call it our own. I've gotta background made for light wave, along with some other light moves, but I'm stuck. I was wondering if it should be like a "wave" like shock wave, or a beam like thing. I've also got ambush in the makings, ambush's into complete, and a background for it, along with some water moves. I'm holding back on psychic (possible psybeam) and surf to see what happens. Umm I'm sorry but, are you mentally intact? You're wondering if Light WAVE should be a wave or a beam?! Actually, it's a legitimate question. Should it be literal, or not? I'm thinking it might be nice to base it off of something like surf. DUDE!!! WHAT THE HELL??? DO YOU HAVE YOUR CROSSHAIRS ON ME?!? COME ON! Dont be calling me mental for asking what people want! Look at the shock wave in DPP, there is NO wave. So please, again I say, "dont piss me off!" Yes well, we all know how much *cough*no*cough* effort went into making DPPl. totally serious though, I dont see why there is so much harshness on DPP. If anything, I'm scared for 5th gen with ferris wheels, and roller coasters. Those aren't pokemon. Move animations were good, to a point. They F**ked up some of them like aurora beam, surf, psychic, shockwave and volt tackle. If we are having shockwave though, how do you differentiate (?) the 2? Small electric charges coming off Shockwave? Making Light Wave more whitish, and have it or the user glow more? Move animations were good, to a point. They F**ked up some of them like aurora beam, surf, psychic, shockwave and volt tackle. This. Do we have tiles for side stairs? Surf wasn't that bad, though. It got the whole "summoning a wave" thing across pretty well. And there really were a lot they improved on...Thunderbolt, anyone? If I get the time, I'll work with that idea of Light wave. thunderbolt I will agree to, that one was good, along with HGSS's thunder. Fangking used side stairs (and even back stairs) in some of his maps, so I'm pretty sure we can figure it out. not to get off topic, but in my map thread, if anyone has the tiles, can they get them for me? I'm kinda wondering still with those tiles...though (along with a load of other stuff) it isn't on our sheet. (why I keep updating it). I just was lookin at uranium, and wow....that actually looks kinda cool...but I gotta keep control. I dont wanna be downloading every hack and developed game there is out there. yah, haven't done light wave yet. Finding out where some of the hacks/fangames using upgraded tiles are getting them from would be a good idea. Working on the ENTIRE TM/HM list, starting with Focus Punch. Just thought I'd let you all kno that these WILL get moving, now that I can actually transparentize my sheets. IB, what size was every box in your Cherry Bomb anim?